On your Integration settings, click on the Amazon tab. Under Feed Options, toggle to Disable for FBA Multichannel Fulfillment. Once disabled, you will not be able to make your FBA inventory available for sale on non-Amazon channels. Zentail will not be able to relay non-Amazon orders into Seller Central for FBA Multi-channel Fulfillment. You can enable or disable FBA for a specific channel. 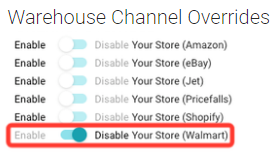 For example, if you wish to disable FBA Multichannel Fulfillment specifically for Walmart, you will need to disable all FBA warehouses for Walmart. This means Walmart receives 0 inventory for the FBA warehouse(s). So for example, if SKU ABC has 100 units in FBA, Zentail will send 0 units of inventory to Walmart if the FBA warehouse is disabled for Walmart. Furthermore, this setting prevents Zentail from routing orders from Walmart to FBA. 2. Find the "Warehouse Channel Overrides" section. 3. For each channel, set the toggle to either Enable (if you want to fulfill orders for that channel from the selected FBA warehouse) or Disable (if you do not want to fulfill orders for that channel from the selected FBA warehouse). 4. Click UPDATE WAREHOUSE to save your changes. 5. Repeat these steps for other FBA warehouses you want to manage on a per-channel basis.